I would think that any cardboard boxes can be used as cheap and renewable toys/hidey holes. So cereal boxes, tea bag boxes, biscuit/cracker boxes and so on. With doors cut in they can be used and replaced at no cost. Fab looking playpen! That's really good deal GreySyrian! If I hadn't bought the zip-ties from halfords it would have been much cheaper but I was impatient and wanted to do it as soon as my cubes arrived haha! Thank you! It is 35.5cm tall. My play pen arrived today! I had already got a pack of small cable ties (they are like an essential item in this house) and my Mum had some tape for the corners, so it's all ready for Marty to try out. I've kind of wrapped it round itself to make it 2 x 3 panels, as for the moment I just want to have a safe area where I can sit and do a bit of hamster-taming. But I might get another pack later, so I can make a really big area...I want Marty to free range in my room when she's totally tame (and bigger!) but this will be perfect till then. If your sister wanted she could double up the panels so the bunny can't jump out too. 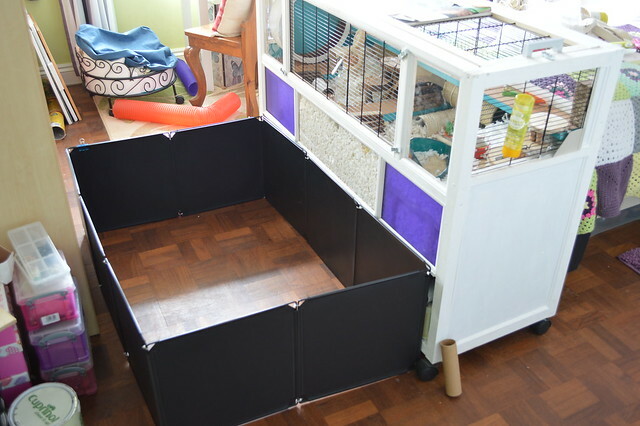 For your Hamster you could make a tube ramp that Marty could ascend into the pen and use to climb back into the cage when they wanted. Lovely set up for Marty you have. Thank you Nancy yes I think the panels would work well doubled up - we will see what Lady Jane makes of them first, but that would be an option if she decides to jump over! I used to put a tube from the cage for my previous hamster, she loved coming and going as she pleased - I would scatter food and bedding in her digging boxes outside the cage, and she enjoyed collecting her 'shopping' and scurrying back home with it! So I will definitely do that for Marty when she is a little more tame!